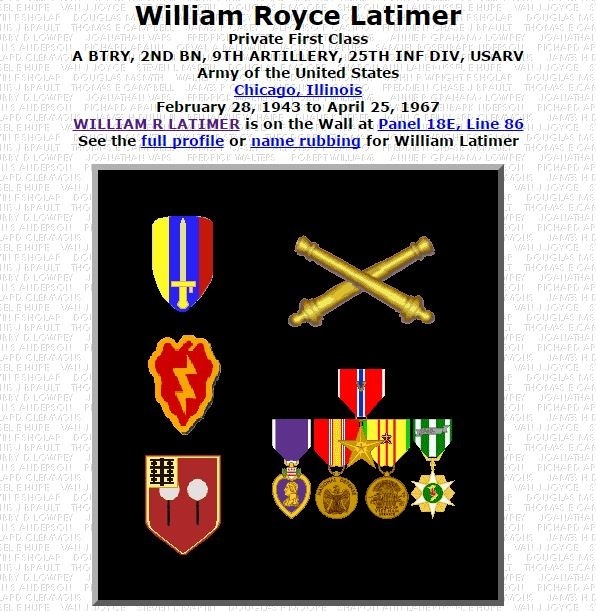 PFC William Royce Latimer died in the service of his country on April 25th, 1967 in Quang Ngai Province, Vietnam. The cause of death was listed as Small Arms/AW. At the time of his death William was 24 years of age. He was from Chicago, Illinois. 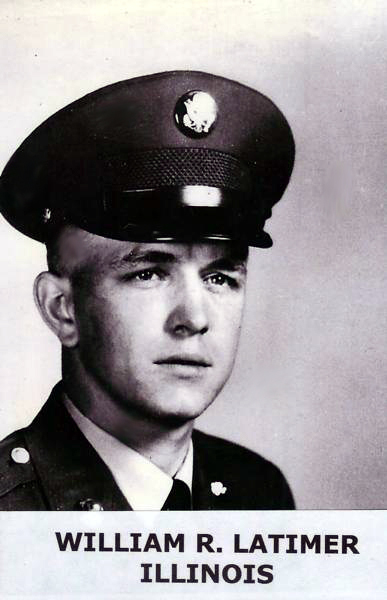 William is honored on the Vietnam Veterans Memorial at Panel 18E, Line 86. His decorations include: the Bronze Star with V, the Purple Heart, the National Defense Service Medal, the Vietnam Service Medal, the Vietnam Campaign Medal and the Vietnam Cross of Gallantry with Palm Unit Citation. Royce lived on 16th Street in Pilsen. He was friends with my father, Lloyd, who also served in the Army. My father thinks Royce (as the CHI guys called him) had an older sister. He also remembers being told that Royce was killed attacking a NVA machine gun nest. Does anyone else remember? 40+ years! My father's uncle and others had a memorial service for Royce at the 4028 Theodore Roosevelt Post in Pilsen (17th and Ashland) when he died.